Worlds Apart: Miniature Tigers wander through time and bare their teeth. As a Phileas Fogg for the 21st-century indie-pop set, Charlie Brand is there to guide you through woolly and far-fetched terrain. 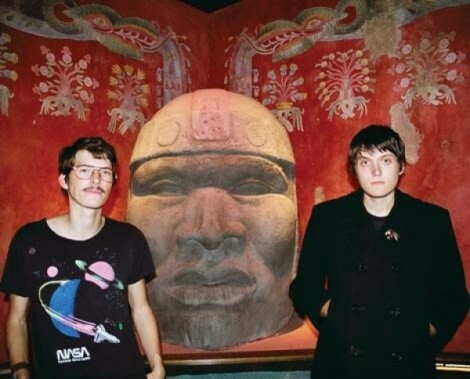 Through 2008’s Tell It to the Volcano (Modern Art), the Miniature Tigers lead singer/guitarist encounters “Haunted Pyramids,” invokes iconic markswoman Annie Oakley, details the side effects of baby dinosaurs maturing, and banishes an ex to a volcano. In “Cannibal Queen,” the album’s dulcet, irrepressibly hooky standout, Brand unashamedly feasts on a female’s heart, noting, “Oh, she lets me right in and I fed ’til I’m full.” These aren’t the scenarios you’d expect to hear an unassuming Phoenix-bred band discuss on their debut, which is precisely why the premise is captivating. Imagination transforms their American pop into something exotic. Keeping muscles in mind, another trait embedded in Brand’s repertoire is his use of the human body—and its destruction—as metaphor. Beneath the Tigers’ sweet veneer is an undercurrent of emotional and physical brutality. In “Dino Damage,” little creatures grow up to dismember their elders: “You gotta let go when they get that old / You gotta let ’em go / ’Cause if you hold on, they’ll puncture your lungs / And separate your spine from your skull.” A woman’s “Hot Venom” meshes with Brand’s blood, painting a picture of both lust (“I can feel it on my fingers and taste it on her tongue”) and its consequences (“You can’t go back now/ That’s not how this works/ And as long as she’s gone, I can never be happy”). Perhaps the traumatic is “Cannibal Queen”: Sure, the protagonist claims to love his victim but she is, after all, being exploited for his satisfaction. “Weird” is a word that Brand says a lot, but it’s hardly a negative. In the hands of the Tigers, weirdness is fanciful. “We set out to do something different each time. The album after this one could be electronic,” considers the frontman with a laugh.